I think I've mentioned before that I've been really busy and totally stressed out at work. When I come home from the office at around 7 p.m., I have absolutely no desire to spend more than 15 minutes preparing dinner. I just want to make my dinner, eat it, and then chill out for the rest of the evening with a cocktail (or two . . . or three) while blogging about, of course, vegetarian food. 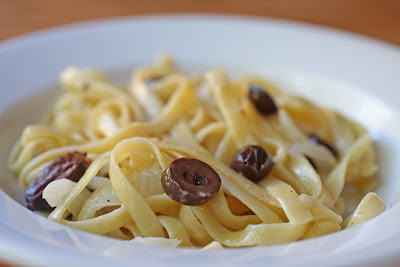 This delicious creamy fettuccine with black olives has been adapted from a recipe in the Williams-Sonoma cookbook called Pasta Sauces. To be more specific, my adaption doesn't require having to boil onions (huh?) and doesn't require having to pull out a blender, which, of course, becomes an additional item you then have to wash after the meal. Screw that. Bring a large pot of water to a boil and begin cooking the pasta according to the directions on the package. In a large skillet, melt the butter over low-medium heat. Add the onion slices and salt and pepper, to taste, and cook until they become soft, about 5-10 minutes. When the pasta is done cooking, drain the pasta and set it aside. Add the cream to the skillet and continue cooking for another minute or so. Add the pasta to the skillet and toss well. Finally, add the parmesan cheese and olives to the skillet, along with salt and pepper, to taste (if necessary). Toss again and serve.